A new report entitled “An Investment Not a Cost” – which was created as part of an on-going Tenants Leading Change programme – has highlighted that tenant involvement can produce benefits of a financial and social nature, as well as having a positive impact on the community. However, the survey found that the benefits are often ignored. 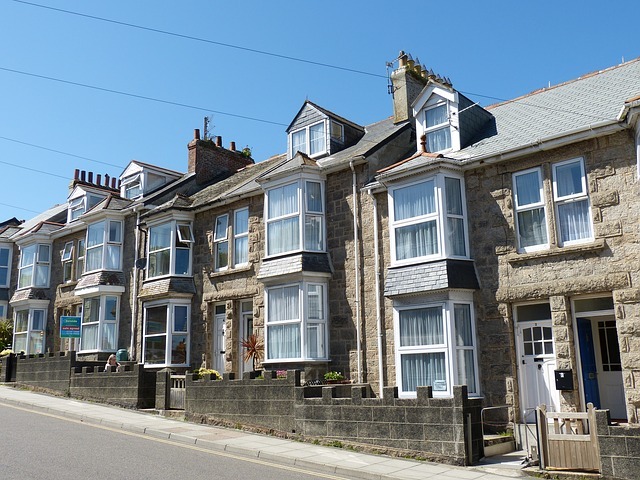 The report claimed that the housing sector needs to put more effort into identifying and publicising the benefits and business opportunities that can arise as a result of tenant involvement. The Tenants Leading Change programme endeavours to highlight the business case for tenant involvement, in order to broaden its reach. As part of the program, tenants and landlords were questioned about financial benefits, service improvement and satisfaction, amongst other benefits. 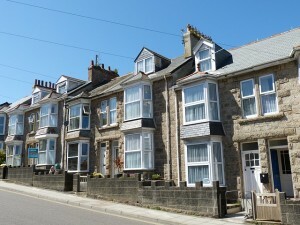 The research engaged with approximately half of the housing industry in some capacity. 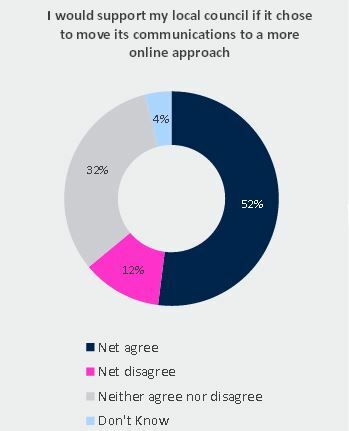 The findings of the research showed that a large proportion of the respondents believed that tenant involvement makes a difference and is beneficial in some way. The figures showed that the respondents largely felt that tenant involvement has the potential to contribute towards delivering value for money services and saving money. The majority of the respondents said that service improvements can arise as a result of tenant involvement. The improvements mostly relate to efficiencies and to tenant focussed services. A percentage of the respondents spoke of the social dividend and community benefits which tenant involvement encourages. Some of the respondents identified tenant involvement as a way for tenants to socialise with neighbours, which as a result contributes to solving the problem of isolation and loneliness. As a result of tenant involvement, many respondents said that tenants appeared more confident, had higher self-esteem and were more employable. Of those working in the housing sector, many believed that tenants have a positive impact on their colleagues, which leads to a more satisfying career. As a result of exceptional growth in recent years, DJS Research is pleased to announce ten new additions to its expanding team, and five internal promotions, as the company gears up for new growth targets. Not only is the company on course to beat its turnover target of £3.3 million – which will take the business into the top 100 market research agencies in the UK – but during the calendar year for 2014, DJS Research also expanded in all areas of the business, including Research, Marketing and Business Development and Operations, with ten new team members joining in quick succession. Faye Waterhouse (Junior Research Executive), Callum McCulloch (Junior Research Executive), George Telford (Junior Research Executive), Emma Lay (Research Executive), Lian Nuttall (Senior Research Executive), Rebecca Harris (Research Manager) and David Marchant (Research Manager) all joined the Research team over the past year, and are using their existing and varied skills to strengthen the market research service, which DJS Research offers. Alongside the new appointments within the Research department, Beth Harcourt joined the Marketing and Business Development team as Marketing and Communications Assistant and Anthea Thompson joined the Operations team as Operations Manager. Also, in the last three months, DJS Research has promoted three members of the Research team across various levels. Julie Rundall, who joined DJS Research in 2011, has been recently promoted to Research Manager, from her previous role of Senior Research Executive. Alex McCluckie, who joined DJS Research in 2011 as part of its graduate recruitment scheme, has also been promoted from Senior Research Executive to Research Manager. Since 2011, McCluckie has worked with a number of local government bodies and has also been a key member of DJS Research’s population profiling tool, Localise. Elliot Simmonds, who was shortlisted as Stockport’s Young Business Person of the Year in 2014, has been promoted to Project Manager – taking responsibility for the overall direction of the agency’s VoicED teacher panel, as well as increased involvement in public sector research. Former Junior Research Executive, Matt Walker, who joined the team in 2014, was quickly promoted to Research Executive in December. The Operations department also saw progression within its team, with Becky Coffey joining the team permanently in November 2014. Coffey, who joined DJS Research in 2013 as Field Assistant, was promoted to the permanent position of Field Controller in November 2014. DJS Research Ltd is due to release details of its record turnover and growth in April 2015. Online Map Shows Local Health Risk: A new map, provided online, allows residents in England and Wales to log on and review their community’s risk of developing a number of conditions, including heart disease, lung cancer and skin cancer such as malignant melanoma. The tool has been developed by Imperial College London – although the researchers stress that it cannot be used to identify the risk to a specific individual. The Imperial College researchers looked at more than 8,800 wards in England and Wales, each with a population of 6,000, and utilised data from the Office of National Statistics and cancer registries for 1985 through to 2009. This data was then mapped, in a similar way to the way Localise can be used, and shows the impact of regional variances in things such as air pollution, sunshine and pesticides. The figures have also been adjusted to take in to account data relating to age, deprivation and any small sample sizes. Some wards in Manchester, Leeds and the Wirral were identified as having higher health risks, whilst areas of London, Norfolk and Suffolk performed better in terms of health. Dr Anna Hansell, who led the research, noted that environmental factors such as air pollution accounted for between 5-10% of a person’s risk of disease, she stated that this was significant in terms of a population study such as this. The site provides a number of maps, one of which shows the relative risk of lung disease in females for instance. As can be seen in the map, there are pockets of much higher risk to communities in the North West centered around Liverpool. 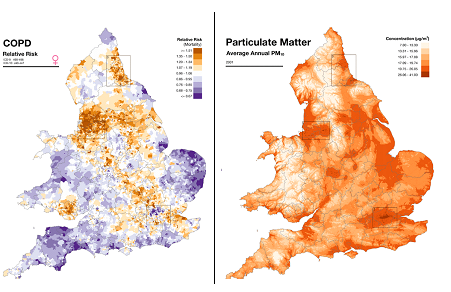 When compared to a map of particulate matter, this correlation becomes more understandable.